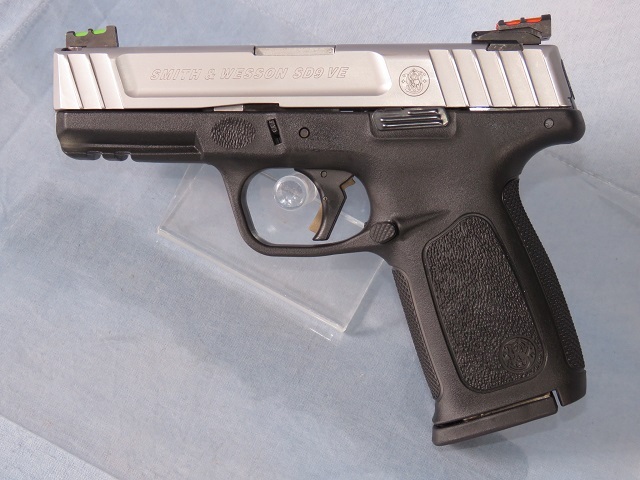 S&W Model SD9 VE 9mm 4 Inch Barrel Two-Tone Finish. 10 Round Magazine. Self Defense Trigger for optimal consistent pull first round to last. Striker fired action. Stainless steel barrel and slide. White dot front sight. Fixed 2-dot rear sight. Standard Picatinny style rail. Polymer frame. Slim ergonomic textured grip with aggressive front and back strap texturing. Textured finger locator.